Went to the No Strangers exhibit at the Annenberg Space for Photography today. So interesting. How we dress, speak and essentially express ourselves are all based off geographical, cultural, religious and personal choices made by those throughout human evolution. Choices that make sense and seems normal to those making them may vary widely between different groups of people - especially those that do not interact with other cultures as much. 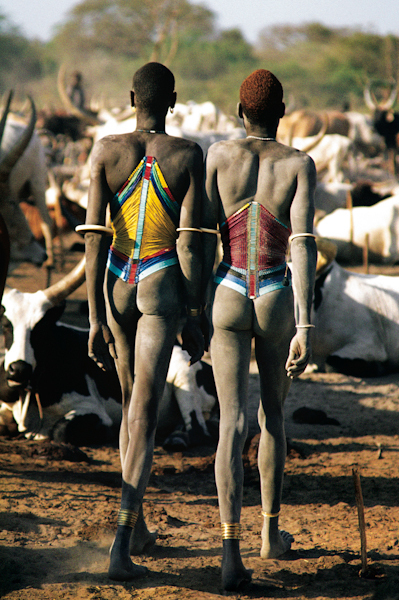 So, in the way that I choose to dress - from a wide array of garments that allow me to express my personality externally - and how that feels normal to me living in the USA, these Dinka men from South Sudan wear colorfully beaded corsets to specify age and status in life, and that is normal to them. Unfortunately, we are loosing languages, land and many unique cultural traditions due to globalization. So while it still lasts, enjoy this beautifully diverse world we live in from which we can pull such extensive inspiration.